Emergency services attending the fire. The boss of a Highland hotel has thanked the quick reactions of the emergency services and his own staff after a blaze broke out in the building. 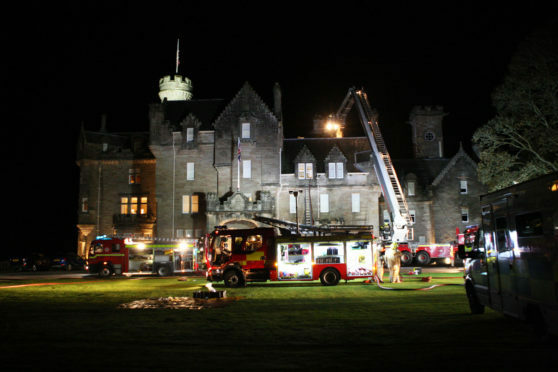 Six fire appliances and one aerial appliance were mobilised to Skibo Castle in Sutherland as staff were forced to relocate guests to alternative accommodation on the estate grounds and to nearby hotels in Dornoch. The alarm was raised at 8.18pm on Monday evening as fire crews raced to the scene to tackle the fire inside the four-storey building. It is believed the fire broke out in a chimney before spreading along to the roof space. Firefighters responded rapidly to combat the fire before it was contained around 9.45pm. Two guests were brought to safety by firefighters as another 40 were moved to alternative accommodation. 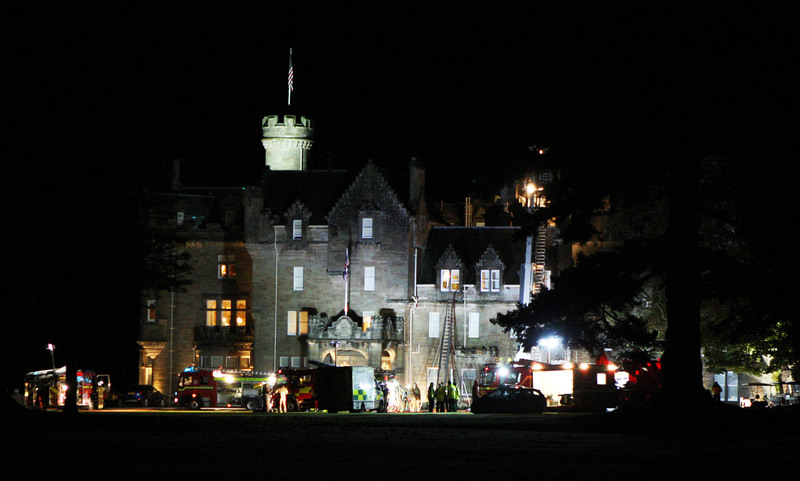 Peter Crome, chairman of The Carnegie Club who operate Skibo Castle, said: “We are grateful for the quick action of the emergency services and also for the exceptional response of our own staff, who assisted guests and volunteered to help in any way they could. Skibo Castle is a well known luxury retreat for the rich and famous, with Madonna and Guy Ritchie opting to tie the knot at the venue back in 2000. Nick Gorton, manager at the Links House at Royal Dornoch, said: “We took some of the guests in here because when something like that happens everybody jumps to help each other out. “A lot of guests from Skibo come down to play golf here so it is good to help each other out because nobody wants to be in that boat and it could happen to any of us. Firefighters were in attendance again yesterday morning to conduct inspections and to dampen down hotspots. Tommy Murray, a chef at the nearby Royal Golf Hotel, said: “The response was good to something that could have been serious. “The fire brigade reacted well. Skibo Castle has attracted some famous visitors over the years including some former US presidents. The castle shot to international fame and attracted a large media presence in 1990 when Madonna married film director Guy Ritchie on the 8,000-acre estate. Stars flocked to the Highland estate to celebrate the occasion, with actress Gwyneth Paltrow serving as maid of honour, as nightclub owner Piers Adam and film producer Matthew Vaughn also stood beside the couple as Mr Ritchie’s two best men. British racing driver Dario Franchitti and American actress Ashley Judd also wed at the castle, in a lavish private ceremony in 2001 – although there was fire drama on that day, too. An electric golf buggy, used to transport guests around the estate, broke into flames minutes after the ceremony had started. Fire crews quickly brought the blaze under control and the service was uninterrupted. The castle also played host to pop superstar Robbie Williams, as friends and family celebrated the star’s surprise 30th. Around 50 guests gathered to join in the five-day celebration, with TV presenters Ant and Dec said to have presented a spoof version of popular TV show Family Fortunes. Former presidents George Bush Sen and Bill Clinton have also visited the castle, with Mr Clinton joining other famed stars such as Sean Connery in playing a round on the estate’s famed professional 18-hole golf course.